The Bridgestone BMW Club Racing Series made their way to the Phakisa Freeway in Welkom on Saturday 22 August for the second time in as many races. A strong field of twenty four entries set out to qualify at the technical Free State circuit for the sixth round of the 2015 championship. Track conditions were very different to the previous event at the circuit, with a dusty surface making things rather tricky. 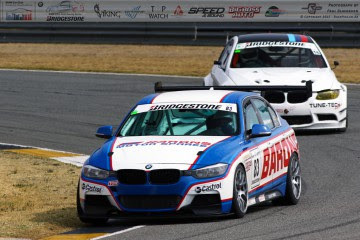 Mishal Sing (E92 M3) narrowly took pole position ahead of Gianni Giannoccaro (E46 M3 GTR) with a time of 1:44.973. 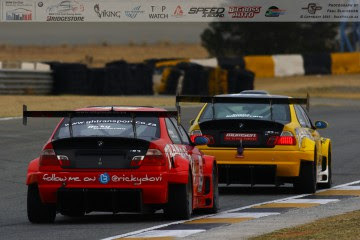 Darren Winterboer (F30 335i Turbo) was quickly coming to grips with his cars new aero kit and placed himself on the second row with Julian Fameliaris (E36 328i Turbo) lining up alongside him. 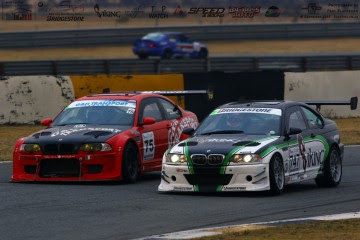 Riaan Woest (E46 M3) qualified in fifth position with Jimmy Giannoccaro (E46 M3 GTR) locking out the third row for the two normally aspirated cars. A number of other competitors were not quite so lucky with their qualifying. 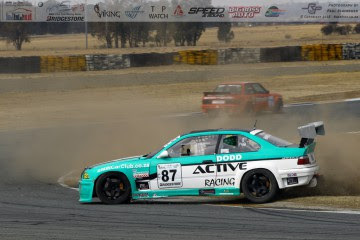 Stephen Tsalavoutas (E36 M3) suffered terminal engine maladies while Arri van Heerden (E30 2.7) suffered terminal damage to the rear suspension and diff of his car. Newcomer Dean Kendal (E36) came in with major overheating problems, putting a premature end to his and team mate Jorge Estrela’s race day. The start of the first race saw a frantic charge down to the first corner. Gianni took the lead with Sing and the rest of the field hot on his heels. Gianni blew his chances when he ran wide through turn three handing the lead to Sing. 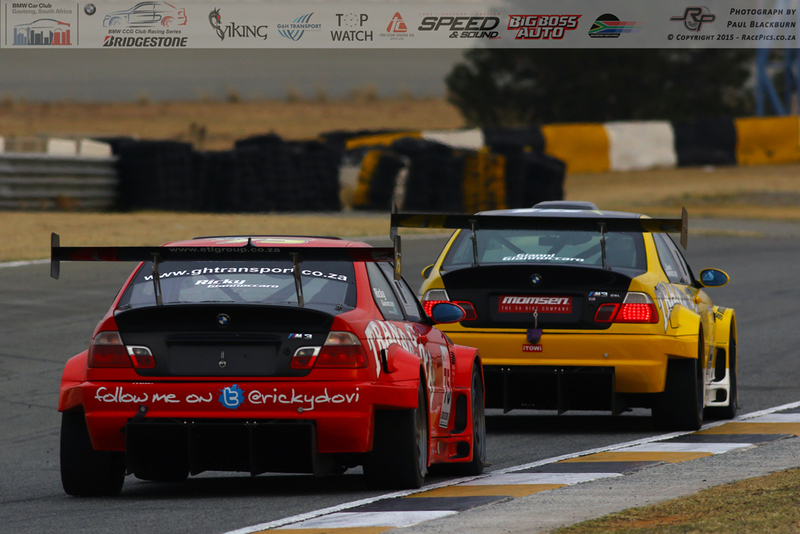 This was short lived however as Winterboer powered past Sing to grab the lead through the very next corner. Sing briefly regained the lead through Coke Bottle corner but it was a fired up Winterboer who led the field across the line for the first time. Fameliaris slotted into third position with Ribeiro, Woest and Jimmy in tow. Teenager Lorenzo Gaultieri (E36 328i) led the class C pack with Warren Dodd (E36 328i) and Stefano Martinelli (E36 328i) all over his back bumper. Martinelli got past Dodd through turn four and set about catching the class leader. Gianni was on the comeback trail and passed Dodd to slot into eighth position on lap two. Craig Ball (E36 328i) saw his hopes of a decent result go out of the window when terminal engine failure ended his race day prematurely. A determined Gianni shot past his father Jimmy through turn one to take sixth position on lap four. This was short lived however when a sudden loss of power saw him drop back and into eventual retirement. Ribeiro and Woest were involved in a battle of their own with the proverbial blanket being able to be thrown over the pair at stages. Dodd lost his third position in class C when he spun out through turn three trying to get past Martinelli. This seemed to spur Martinelli on as he closed the gap to Gaultieri and attacked him through almost every corner. He made his move down the back straight on lap five and took the lead before the back sweep. Winterboer was in a class of his own as he romped home to the Overall and class B victories in his newly winged beast. Sing took the class A win with a comfortable second place while Fameliaris took an unchallenged third. Martinelli was able to keep Gaultieri at bay to take the class C honours. Andreas Meier (E36 328i) pulled a rabbit out of the hat by beating the rest of the class D regulars to the finish line to take his first win in the series – in only his second event in the series! A reverse grid by class for the second race would set the proverbial cat amongst the pigeons once again. Sing grabbed the lead ahead of Ribeiro and Giannoccaro Senior, with Woest and Winterboer in hot pursuit. Winterboer was up to third by turn five with Fameliaris grabbing fifth position through the same corner. Dodd took the early lead in class C ahead of Gaultieri and Martinelli. Gianni Giannoccaro was scything his way through the field from the back of the twenty car grid to slot into seventh position by the end of the first lap! Sing held onto the lead ahead of Winterboer as they crossed the line to start the second lap. Ribeiro was having a strong run in third with Fameliaris, Woest and both Giannoccaro’s in tow. Dodd held onto the class C lead ahead of Martinelli and Gaultieri. Mike Salt (E36 323i) caught the rest of the class D pack napping off the line and took an early lead. 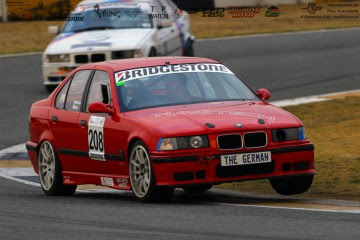 Stand in driver Morne Visagie (Edwin Dreyer E46 M3) slotted into second place with series newcomer Jan Eversteijn (E36 328i) and the rest of the brat pack in tow. Winterboer grabbed the Overall race lead before the end of the third lap with Sing defending his second place from Ribeiro and Fameliaris. Martinelli had passed Dodd to grab the class C lead with school boy Gaultieri keeping Dodd on his toes. Gianni was up to fifth position on lap three when he passed Woest for position. Giannoccaro Senior started challenging Woest as well with the pair running side by side through turn five. Gianni was on an absolute charge and soon grabbed fourth position from Fameliaris (who was stuck in fourth gear) as well. Rick Loureiro (E30 3.0i) was having a great race and was lying in fourth position in class C but a sudden fuel surge forced him into retirement shortly thereafter. 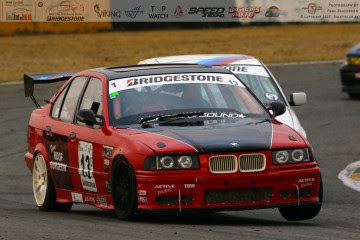 After a disastrous first race Trevor Long (E36 328i) was hunting down the class D leaders. He was closing in on Eversteijn at a rapid rate of knots and passed him for third on lap five. He then grabbed second position from Visagie on the very next lap. Giannoccaro Senior then passed Woest through turn five on the same lap with the latter losing pace with worn tyres. The battles throughout the various classes were closer than ever with an all or nothing approach being taken by most competitors. Gianni was closing in on third placed Ribeiro and was desperately trying to find a way past him. Dodd was also closing in on Martinelli who appeared to be battling with a fuel surge problem as well, and took the class C lead through turn three shortly thereafter. Long had caught up to Visagie by the fifth lap and passed him for second place in class D. Visagie then threw away an almost certain third position when he spun coming onto the back straight on the penultimate lap of the race. Giannoccaro Junior had played a waiting game and finally made his move through Coke Bottle corner on the last lap of the race to gain third position from Ribeiro. Winterboer repeated his first race dominance to pick up the double on the day. Sing took the double in class A with yet another untroubled second place. Giannoccaro Junior was in fine form as he crossed the line to take an impressive third position overall. Dodd took a popular win in class C while Salt had to work hard to keep a hard charging Long at bay to claim the class D honours. The seventh round of the championship will see the series return to the Zwartkops Raceway on 24 September a public holiday for South Africans celebrating Heritage Day. They will once again join the Extreme Festival Roadshow in what is expected to be another action packed day of racing. The Club was formed in 1981 to afford like minded enthusiasts the opportunity to interact with each other through a comprehensive calendar of events, a club magazine and website portal. 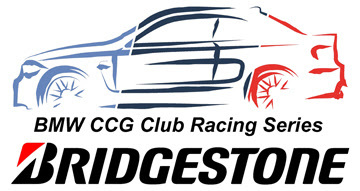 The Club also organizes adrenaline and social based events such as breakfast runs, classic car gatherings, Concours d’Elegance competitions, noggins, weekend trips, gymkhana’s and top speed events. The Club is proud of its family ethos where all enthusiasts are welcome. Annual membership starts from as little as R350, more information is available at www.bmwcarclub.co.za. The post Race Report: Bridgestone BMW Club Racing Series – Round 6 – Phakisa appeared first on RacePics | RacePics - Captured in a split second, forever..